Once you've learned and practiced the StoryFire method, you may want to teach others to do the same. 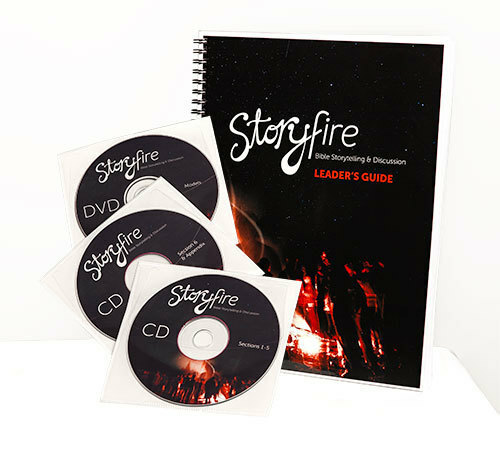 The Leader's Guide gives step-by-step instructions on how to teach each StoryFire model. It also includes a resource section that provides extensive lists of Bible stories for practice and ministry. 160-page booklet-style Leader’s Guide. This guide gives detailed instructions for each of the Bible storytelling models taught in the StoryFire series. It includes important method principles, and preparation instructions for all of the models. Bible story resource section. Select stories from the resource section of the StoryFire Leader's Guide. Most of the stories in the Bible are included in five extensive lists–Old Testament, Life of Jesus in Chronological Order, Parables of Jesus, Teachings of Jesus, and Acts to Revelation. Audio series on two CDs. The six-part Bible storytelling and discussion series on a two portable CDs. Can be played in a CD player. Videos on DVD. Portable DVD resource with all the demonstration videos. Have questions or comments about this series? Contact us at ltcom@maf.org.